1 Million birds might be dying each year due to PVC mining claim markers. The American Bird Conservancy notes in a press release that a million birds may be dying each year after becoming trapped inside PVC pipes used to mark mining claims throughout the country, but mainly in the west. Small birds apparently see the opening of PVC pipes used to mark mining claims as a hollow suitable for roosting or nesting or possibly gathering to pool body heat during migration. The birds may enter the holes, only to become trapped because the walls are too smooth to allow them to grapple their way up the sides and the pipes are too narrow for the birds to extend their wings and fly out. Death from dehydration or starvation follows. The problem is so severe that Nevada even passed a law in 2009 which invalidates all mining claims marked with uncapped or uncrimped pipes and allows citizens to pull them and lay them on the ground nearby. Having uncapped pipes of this nature is a violation of the Migratoy Bird Treaty Act. 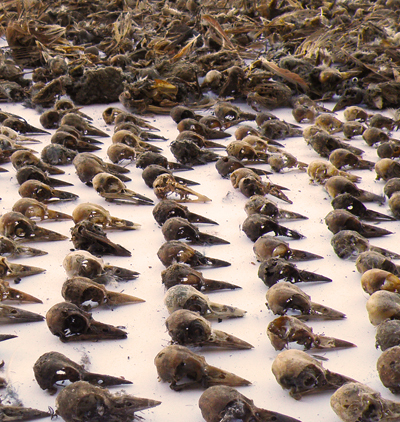 4 Responses to 1 Million birds might be dying each year due to PVC mining claim markers. This was brought to my attention a couple of weeks ago. Never would have thought about it before and wouldn’t have known a mine claim marker if it jumped up and bit me. I spend a fair bit of time tromping around sagebrush country and cover the opening of any open-top markers I come across with big rocks. I have seen a few PVC pipe markers that have series of holes drilled in them. I can only assume this gives birds the traction needed to get out because I haven’t found any dead birds in these. Thanks for spreading the word. I think the holes in the pipes are to make them weigh less for the miners to carry up the mountain, not to help the birds. Thanks for covering the markers Pam. I enjoy birds much more than mining claim markers or survey stakes. Hmmmmmmmmmmmm…….